Picture from Bessie and Frank's collection. 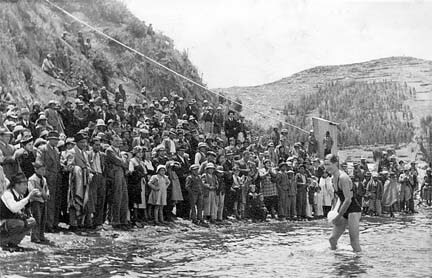 Nelson Beck after winning the swimming race across the Straits of Tiquina in Lake Titicaca. 1939. The Bolivian Navy is located on the site that Dad finished the race. We traveled up the road to an over look near the cemetery to match the angle and position of the photo. Bessie states in letter: "The teacher in charge of the physical education at the American Institute had a swimming pool built on the grounds of the school so that the students could learn to swim. 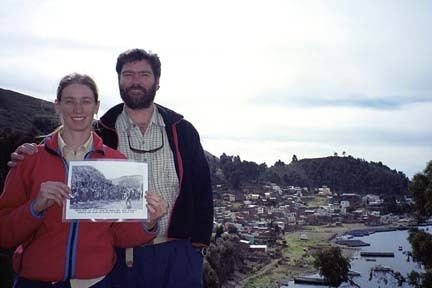 This teacher helped organize a swimming tournament across the Straits of Tiquina, a narrowing of the two parts of Lake Titicaca I do not know the exact width of the straits, but it takes a motor launch a half-hour to cross it. The water is very deep and very cold. When you decided to enter the race we were in the States on a short furlough. I do not know if we would have approved a you entering the race. But you entered and won the race, for which you received a trophy. We were proud of you for having achieved this feat."